Abelen, Kansas, 1910… a lone traveler enters the town after what seems a long hard ride through the countryside, needing a drink there’s only one place on this man’s mind. The smell of liquor in the air, the wafting of tobacco, the dust and grime hauled in from the street every time some son of a gun walked through those swinging doors of the local saloon, Silas Greeves finds comfort in it’s familiarity. It’s not long before he’s recognized and what seems like an enthusiastic young man who with the sound of excitement in his voice can’t wait to buy Silas a drink. A celebrity in this young mans eyes from what he’s read in his Dime novels, Silas obliges his interest in him and decides to give a recount of his past, beginning with his encounter with Billy the Kid. 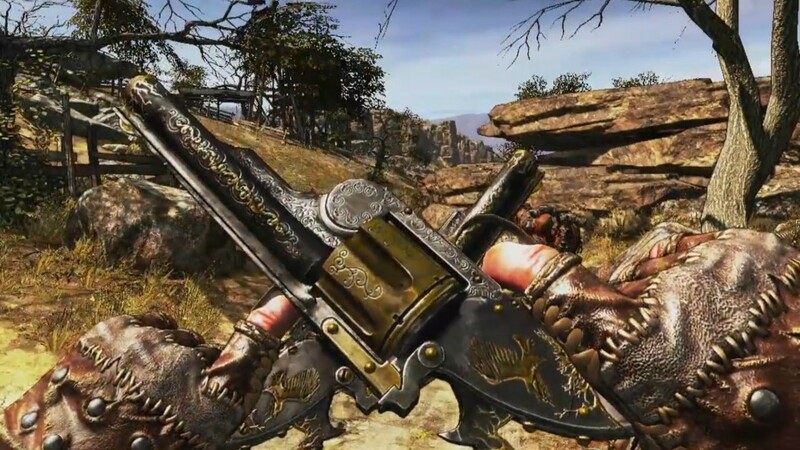 Call of Juarez Gunslinger starts off just as the rest of the game plays, fast paced and fun. No tutorials or shooting practice given, or needed for that matter as we’re thrown straight in from the get go. Wielding your trusty six shooter that whenever fired sounds just as lethal as the shot itself, we’re given our fair share of enemies to take down, each kill awarding XP allowing the player to upgrade their skills. Gunslinger, Ranger and Trapper are the three routes the player can go when upgrading skills and abilities, each one having it’s own unique perks. Allowing for different styles of play, from the dual wielding gunslinger firing off countless rounds at a time and the the long range player picking off enemies from afar to the up close and personal type. It wouldn’t be a wild west shooter without some one on one duels. The camera focuses on the next enemy to hit the dirt as we’re to keep them in focus until a percentage bar hits a certain point and Silas’s itchy fingers are able to grasp the gun from the holster and fire off the winning shot. This is a nice contrast of play from it’s constant fast pace to a more concentrated finger nail biting moment. The story seems to take second place here and I don’t want to say it’s not worth paying attention to, even though we’re treated to very nice cutscenes now and again, the action and gameplay is where it’s at. Cutscenes shown in a style of animation that suits the play by contrast to it’s gameplay and with a narration that’s pleasant to listen to along with some witty dialogue. You just can’t wait to start racking up those points again while watching the movie sequences. It’s cell shaded look fits in perfectly and that blood spatter as an enemy is killed looks great. Want to be the best of the best and show off your wild west skills? Then get in on it’s arcade mode. Here the player can take part in short timed levels that have decent replay value, the object here, rack up as many points as possible, get the highest multiplier and top those online leader boards. Duels are also an option to play again here so we’re not limited to one type of challenge. The game’s arcade style of play is what makes this game great, it knows what it is and doesn’t try to make the player feel any different, we’re here to shoot some guns, take down as many enemies as we can and oh yes blow up those red barrels and watch the points soar. 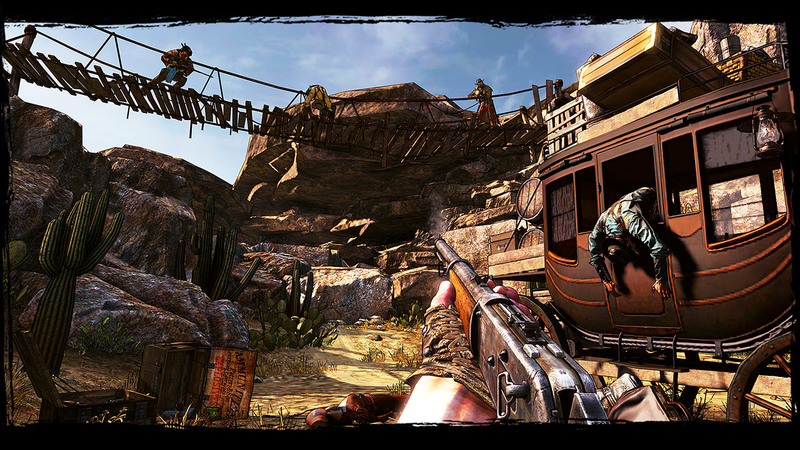 Call of Juarez: Gunslinger is a Western-themed first-person shooter video game, the fourth in the Call of Juarez series. Released in 2013 on the Playstation Network, Steam and Xbox Live Arcade and developed by Techland and published by Ubisoft. It is available as part of this months PS Plus instant game collection. Enjoyable and fun with replay-ability, what more could you want from a PS+ game if not any other for that matter. If you have PS Plus you can download the title here. Reviews. PS+ Plus Pick of the Month.